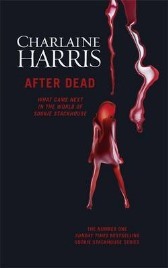 It’s finally here: the last novel in Charlaine Harris’s Sookie Stackhouse series, also known as True Blood. Dead Ever After is book number thirteen, and we finally learn whether Sookie gets her own happily ever after – and who with. The story so far is almost impossible to summarise. so I’ll just mention recent events. In book number twelve, Deadlocked, Sookie and her vampire love Eric were having some problems due to a situation created by Eric’s maker, the now permanently deceased Appius Livius Ocella. Someone had tried to frame Eric, Sookie and friends for a murder. Deadlocked ended with a showdown which revealed who was behind everything, and led to Sookie using her cluviel dor, the fairy love token which gave her one wish. 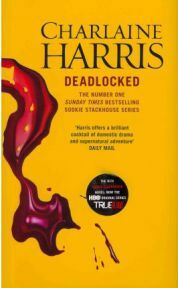 Deadlocked is the twelfth novel in the Sookie Stackhouse series by Charlaine Harris, also known as the True Blood series after its television adaptation. Sookie is a waitress in Bon Temps, Louisiana, and she is telepathic. After meeting vampire Bill Compton at the start of the series, she has been drawn further and further into the supernatural world, which of course presents plenty of dangers to her. In Deadlocked, Sookie is still in a relationship with the local vampire sheriff, Eric, in fact in the eyes of the vampire community they are married. 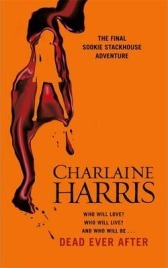 But all is not well for them, especially when Sookie finds Eric drinking from another human woman.